The use of tail stocks, steady rests, sub spindles, twin turrets along with C Axis, CY Axis and B Axis are regular features on today’s Multi-Task machine tools. In this collision rich environment, the programming of these machines is made simple and safe utilizing EDGECAM’s turning and milling combinations in a single environment. 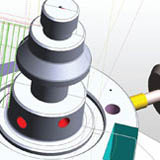 Mill/Turn Simulation EDGECAM offers a full kinematic Simulation package. All the cycles and movements are supported along with the full graphics of the machine, tails stocks and steadies meaning peace of mind as the part is fully tested before reaching the actual machine tool. The simulator being a very powerful tool in its own right offering full collision detection including many display options allowing the user full control over every aspect of the simulation. Feedback is given to the user showing which commands are being simulated, this will also display which elements of the program may have caused issues. 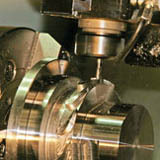 Comparison tools will confirm the part is being machined as expected before outputting to CNC code to the machine tool. Mirrored Turning EDGECAM functionality will program turret movements which are mirrored about a plane on the Z axis and shows the toolpaths lying on the opposite side of the Z plane. The mirror cycle is a very powerful command that will allow various mirrored operation to be performed, such as, a right and left handed turning tool to action a Rough Turn and also Back Turn simultaneously. Turret synchronization will also be include where required. Synchronised Turrets A feature often needed by engineers is Synchronization between Upper and Lower Turrets. 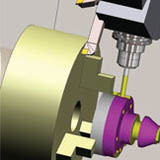 EDGECAM performs this function with ease. Use of wait commands simplifies the synchronization of the Upper and Lower turrets when wanting to use these independently. The synchronization function is a major requirement in order to perform start and stop procedures with the upper and lower turrets and maximize efficiency in cycle. EDGECAM tvisibly defines these operations in the manufacturing sequence and none productive time is clearly shown in the sequence time line.